Zappa.com • View topic - Does George Duke ever play any FZ at his shows? Does George Duke ever play any FZ at his shows? 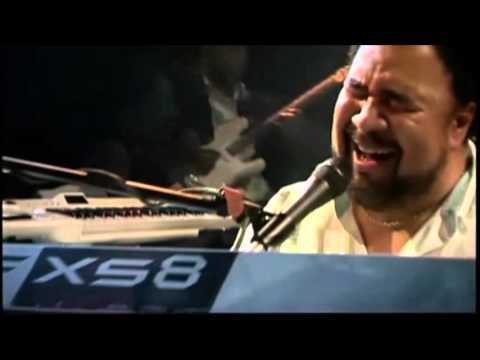 Post subject: Does George Duke ever play any FZ at his shows? Post subject: Re: Does George Duke ever play any FZ at his shows? Sweet - the youtube is recent so that's promising. Thanks! I'll report if there's anything to report. This is from a small club in my small hometown. But I didn't bother to attend this show just for the probability to hear a few FZ snippets, no matter that it is the great GD. I simply can't stand the rest of what GD is doing these days. I like what the guitar player does during Uncle Remus here, though. I like it mostly because cant remember hearing ZF band playing Uncle remus live,band only played it twice according too giglists,and a further 4 times last tour 88. The guitar playing was Top on GD video. The last time Ray white was posted on this forum play City of tiny lights he was with ZPZ shortly after. I've seen GD a couple of times- the first time was about 6 or 7 years ago and he did a nice chunk of 'Remus'. The last time a couple of years ago he ended one of his tunes with the last bit of 'Echidna'. I haven't seen him on the west coast for quite a few years,but I here GD's been working in Europe with and without other MOI-Mothers,Zappendale and some orchestra stuff with NMB.Yes,he did do some FZ snippets last time I saw him.I would really like to see-hear him again soon. When is Adrian Belew & the Slicks coming`round here again?That really would be something if Adrian Belew played with Dweezil.He complimented FZ so nice on guitar.Ahh,why doe's that have to be a pipe dream? Lift the ban. Adrian did sit in with ZPZ doing the Dylan voice on "Flakes" a year or two ago. I don't know if he'd want to join on guitar, probably trying to focus on his own stuff. He mentioned on his blog that Eric Slick is touring with another band (Dr. Dog). George did not mix any FZ into the show I saw. He only had a 50 minute set co-headlining with David Sanborn at the Ohio State Fair. It was entertaining, however. The beginning of the set was jazzier material, then sort of drifted into soul/R&B stuff, then finished up in a funk frenzy. He really worked the crowd. I don't think his keyboard playing was highlighted much though. Sanborn's keyboard player actually stole the show from that perspective - I should probably take a second to google his name, but that guy was incredible. Yes.There are two shows for sure coming up in LA. Dweezil announced that GD will be joining DZpZ for two shows. 12/3/10 & 12/4/10. I would of gone fer sure had this come out earlier...I have tix for SF 12/1/10 and Reno 12/2/10.Very tempting though. You goin' to any of the shows? GD's schedule looks free for awhile after that. So who knows,maybe he'll join DZpZ for the rest of the tour. Nope, not going to any of the shows, living in BFE in correlation to any dates. El Bummo cal. Live Zappa wise. Probably the best two ZPZ shows that ever happened. I met George after the show. Definitley my #1 live Zappa experience. In the 70s, I saw the George Duke/Billy Cobham band in New Orleans. They played a version of Echidna's Arf, which was fast, and dominated mostly by Duke's keyboards. Man, that was a badass band! That must've been the closing section of Echidna's Arf, as performed by the Bongo Fury lineup and as recorded on "The Aura Will Prevail". Here's a very tasty medley, professionally shot and recorded. ^ Totally bitchin, keen, and nifty. Thanx, mng.